Since Jointers are frequently referred to as Jointer/Planers, they're one of the most misunderstood of all woodworking machines. Here's the straight scoop. Jointers are used to smooth and square board edges in preparation for glue-up into wider panels... mostly for cabinet and furniture projects. Thickness Planers, on the other had, are used to bring boards to a precise, pre-determined thickness by shaving their surfaces and making them parallel with one another. So, can you "thickness" on a Jointer? The answer is yes - and - no. 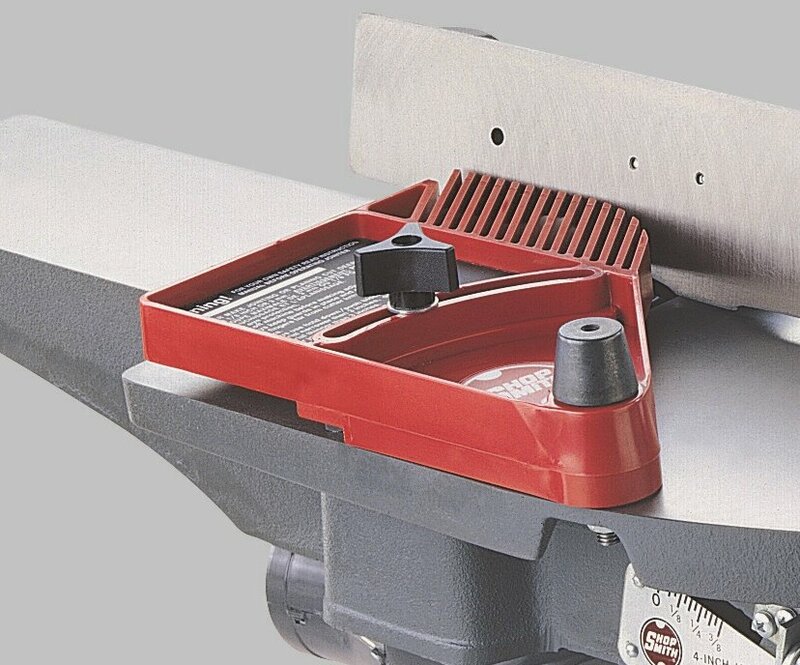 Although a Jointer will plane and smooth surfaces (no wider than its knives), since they offer no provisions for keeping one surface of your stock parallel with the other, true "thicknessing" isn't normally a job for the Jointer. 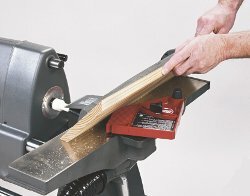 How big should a Jointer be? If its going to be used primarily for planing the edges of boards (with only an occasional need to surface narrow stock) - and since few people work with stock thicker than 4" - why pay for capacities you don't need? Bevel or Chamfer Edges - Create smooth, precisely beveled or chamfered edges on boards for angled cabinetry; making decorative interior or exterior columns; creating a bowl or vase glue-up for lathe turning; or cooperage (barrel/container-making) projects. No sanding required! Eliminate Cupping - Boards are often cupped or hollow on one side. As long as they're no wider than 4", you can eliminate this cupping with a few light Jointer passes. This will, of course, change board thickness. Square Large Stock - Squaring large (thick) stock on a table saw can often tax its capabilities... especially with resinous woods. 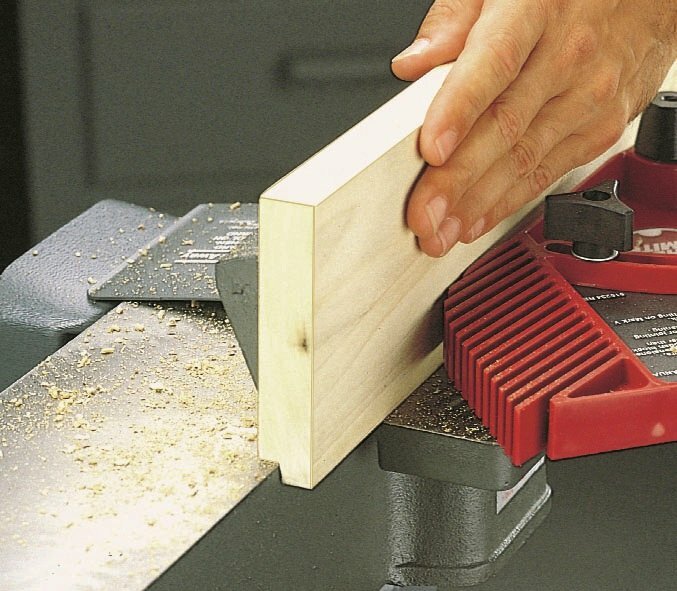 Use your Jointer to deliver a perfect 90° angle on stock up to 4" thick every time. No sanding required! Form Precision Edge Rabbets & Tongues - (up to 3/8" deep) - Form a perfect, 90° rabbet or tongue (for tongue-and-groove joints) along the edge of a board with your Shopsmith Jointer. No sanding required! Tapering - Just clamp a stop block to your Jointer's Fence and you can cut perfect tapers for table legs, stair or deck posts and more. No sanding required! Create Octagonal Columns or Posts - Just set the Jointer Fence at 45° and make a series of passes to pre-round square stock for Lathe-spindle turning... or to create perfect octagonal columns or posts. No sanding required! As with all Shopsmith Special Purpose Tools, your Jointer offers a number of great features and accessories to help you make everything you make - better. 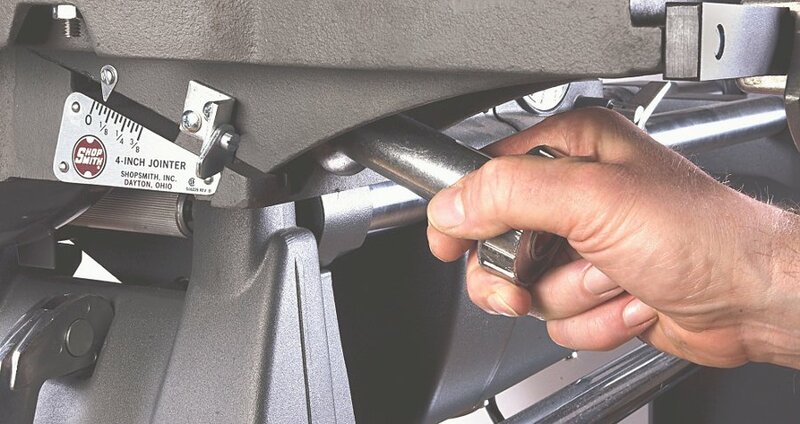 Mark 7 / Mark V or Stand Mount Every Shopsmith Special Purpose Tool offers you the option of mounting and powering it with your Shopsmith Mark7 or Mark V - or with its own, individual, motorized Stand. Safety Feather Guard Special Guard is spring-loaded to exert continuous pressure against the workpiece, forcing it against the fence while you make your cuts. To increase or decrease tension, just loosen the tension adjustment Knob, move it along its adjustment arc and tighten. Simple Knife Leveling and Clamping System Your Shopsmith Jointer's individual knife leveling screws let you adjust each knife end up-and-down individually to compensate for variations created during sharpening. 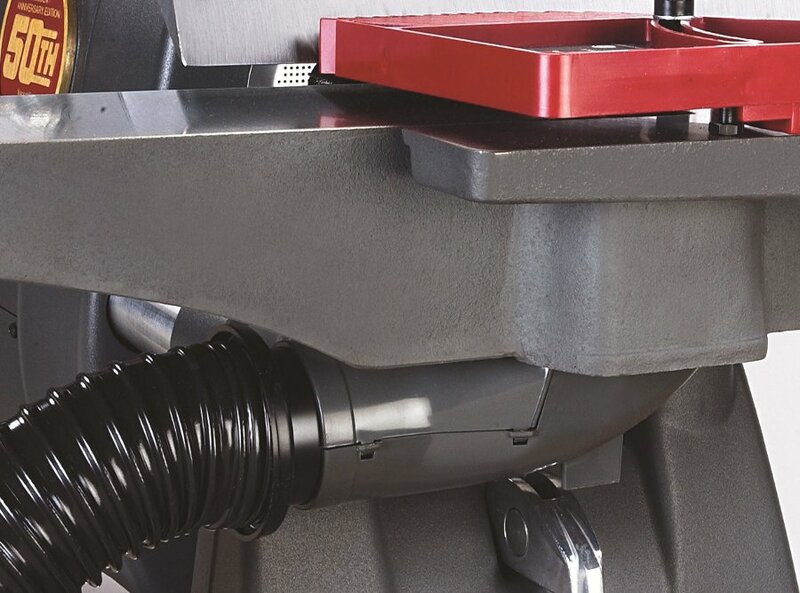 As a result, you'll be able to sharpen your own knives using our special Planer/Jointer Knife Sharpener, without the need for costly professional match-grinding. 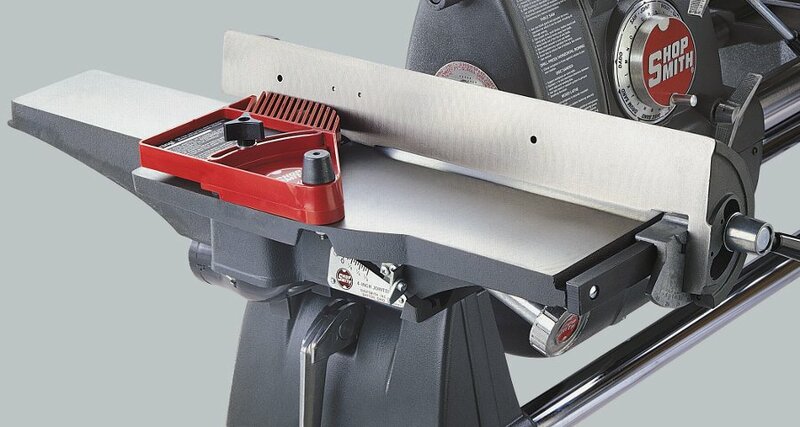 Full Tilting Fence The fence on your Shopsmith Jointer tilts up to 45° left or right and offers adjustable auto-stops at common angles for rapid adjustment convenience. Built-In Dust Collection Chute Built-in 2-1/2" dust collection chute helps you capture the dust and debris before it gets into the shop environment. 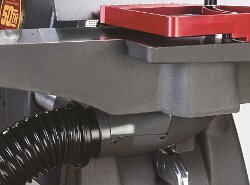 Maximum Width of Cut 4"
Maximum Depth of Cut (Single Pass) 3/8"
Maximum Depth of Rabbet Cut 3/8"
Infeed Table 5-1/2" x 13-1/4"
Outfeed Table 4-1/2" x 13-1/4"
Order on the Web or by Phone, if you prefer -- . Copyright © 2018 RLFShop LLC-Shopsmith All rights reserved.